The malagasy called them ‘Renala’ meaning ‘Mother of the Forest’. 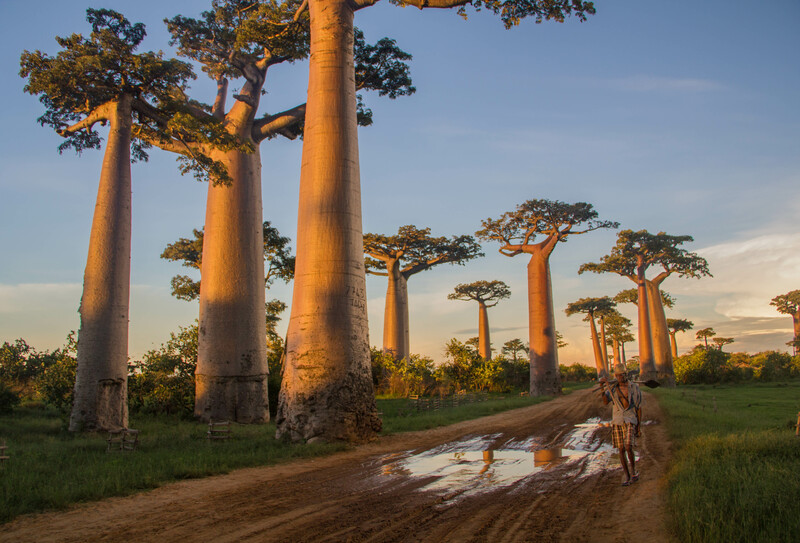 We knew them as Baobabs or Adansonia grandidieri, a species endemic to Madagascar, and a reminder of the island’s 88 million year isolation following its split from India, enabling the evolution of such weird and wonderful creatures of mother nature. They are bulbous structures, trunks wrinkled like skin aged from years of sun exposure, thickening then bottlenecking where their branches abruptly radiate. Bizarre in physique they are like trees which have been uprooted, upended, surreally displaying their roots for the world to see. They are all that is left in this area in western Madagascar of what was once dense tropical forest, cleared as the population grew, land was cleared and agriculture expanded. They have been left out of respect, but for how long? Effluent from the surrounding rice paddies and sugar cane plantations, together with further deforestation and forest fires threaten their survival. In a country where poverty is widespread and corruption rife, conservation of potential food and timber resources is not a priority. I´m looking forward to seeing more pictures on your great blog!